One of the great joys of expedition cruising is meeting new people who share your passion for exploration, discovery and enrichment. Often just sitting at a spare seat in the dining room can yield great rewards and such was the case when I met Tina at dinner aboard MS Expedition. Tina patiently let me reel off some of my own experiences before amazing me with her own. This is just one of them. I thank her for so eloquently sharing it with me here. Most visitors to Gran Canaria are drawn to the sun-soaked beaches and lively coastal towns that are strung together by threads of black asphalt. From the surface, there appears little historical significance other than Christopher Columbus, who landed in Las Palmas in 1492 to repair his ship before heading across the Atlantic. Strolling along the Maspalomas Paseo (boardwalk), we are lulled into thinking that the Canaries have always been Spanish, having arrived in the archipelago in the 1400s. In our haste to photograph the next awesome wave, we might not even notice the small enclosure around a stone dwelling next to the great beach, or the sketchy translation on a boring marker that describes the ancients. Indeed, most Canarians do not seem that interested in their own pre-history, which dates back to the 5th Century, but like all good mysteries, this one is thought-provoking. The remains of their troglodytes, or groups of indigenous dwellings, are dotted around the coast of Gran Canaria, however, the most important archaeological site, called Cueva Pintada, is only a short drive to Gáldar from the Port of Agaete, on the north side of the island. The town of Gáldar is situated at the foot of the mountains, 2 km from the coast and 21 km from Las Palmas. Both ports connect Gran Canaria to the other islands, such as Tenerife and Fuerteventura, making it accessible to travellers on marine expeditions. Who were the fair-skinned and tall-statured people called the Guanches? How did they come to be in the Canary Islands in 400 AD when Rome was being sacked by the Visigoths? Who dropped them off and for what reason? Were they exiled from Northern Africa? What connection, if any, do they have to the present-day cave dwellers who live in the ravines? The origins and practices of these people remain a mystery and were little studied by historians until the 1970s. As the story goes, in 1873, a farmer was working in his fields when he stumbled into an opening in the ground leading to a small roof above a concealed chamber. Here he discovered the only known cave paintings created by the Guanches. The find was duly recorded, and some researchers visited the site, but it didn’t arouse much excitement at the time. It took another 100 years for it to open to the public and soon after, like the famous cave drawings in Lascaux, in southwestern France, all the foot-traffic and exposure began to affect the original colours. Today, this world-class museum, Cueva Pintada, is entirely covered, and the paintings are strictly protected by glass and from light. Museo y Parque Arqueológico Cueva Pintada - Gáldar, Gran Canaria from Tomás Correa on Vimeo. 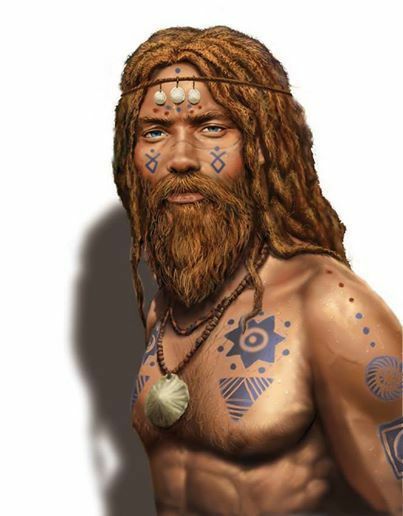 Current scholarship suggests the Guanches were of African-Berber descent, and possibly arrived on Phoenician trading ships. Other historians argue that the Guanches were Celts from Western Europe, who also roamed the Atlantic. They had sheep and goats, and a knowledge of subsistence agriculture, but were Neolithic (locked in the stone age). They were great potters, created stoneware, art objects and "stamped" their skin with designs, but never invented the wheel. They swam and ate fish but never built any boats. Totally isolated, they lived a peaceful existence, developed a hierarchical class structure and practiced spiritual rituals, including mummifying their dead. However, they left no written record aside from the cave paintings, and, as yet, some undecipherable markings. Clearly more research is needed! By the 15th Century, the Guanches had built 30 villages and lived in other smaller communities making up about 20,000 inhabitants. After the conquest by the Castilians, only about 3,000 survived. Although they were fierce fighters, most had begun to have breakdowns within their own societies, while others were sold into slavery and deported. Despite 50 years of resistance, a few brave Guanches fled into the interior to try and retain their family groups, living in well-fortified caves, some of which can still be seen in ravines that were supported by fresh water. But most were finally beaten down by 1483. If you can divert your attention away from the crowded beaches to roam among the ruins and hike in the barrancos (ravines), the presence of the Guanches will stick in your thoughts and haunt your conversations when you least expect it.